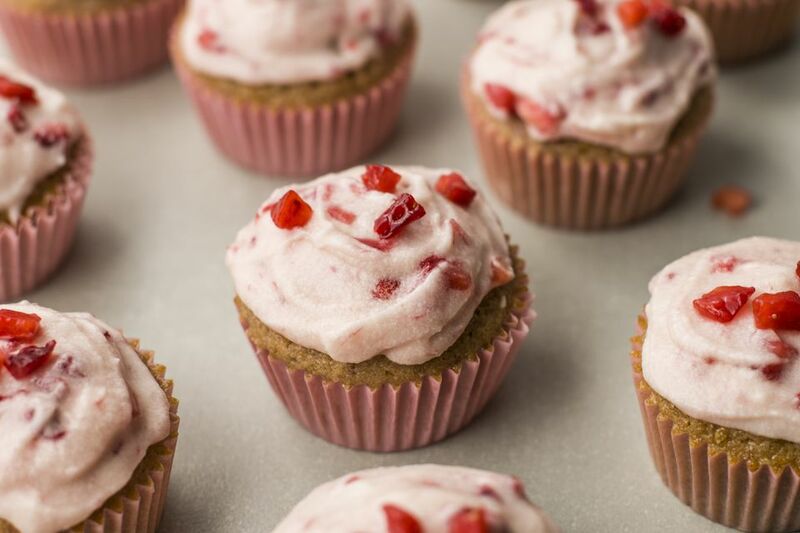 These homemade strawberry cupcakes are made with fresh strawberries and no cake mix or jello. The result? Moist and tender delicacies that are bursting with fresh strawberry flavor. But what really makes these cupcakes stand out is their icing: a basic white frosting dotted with fresh strawberries. Note: while there are multiple steps to this recipe, this cupcake dessert is broken down into workable categories to help you better plan for preparation and baking. Preheat oven to 350 F. Line a muffin tin with paper liners or grease. Place strawberries in a blender or food processor and purée until smooth. You will need enough strawberries to yield 1/2 cup strawberry puree. Mix strawberry puree with milk and vanilla. Set aside. In a large bowl, cream butter for 1 minute. Alternately add half the strawberry mixture, then half the flour mixture, into the wet mixture, mixing until blended. Use an ice cream scoop to fill muffin tins. Cool strawberry cupcakes 10 minutes in muffin tins, then transfer to wire racks to finish cooling. Beat butter and sugar with an electric mixer until smooth and fluffy. Add vanilla and 1 teaspoon of milk. If frosting is too thick, beat in another teaspoon or two of milk until icing reaches desired consistency. Frost completely cooled strawberry cupcakes with fresh strawberry icing.